One-sentence summary: A destitute poet finds creative inspiration and passion with the dreamy and very married Edgar Allan Poe. Do I like the cover? : I do -- it's spot on for the book! First line: When given bad news, most women of my station can afford to slump onto their divans, their china cups slipping from their fingers to the carpet, their hair falling prettily from its pins, their fourteen starched petticoats compacting with a plush crunch. Why did I get this book? : I am a huge fan of Cullen's previous novel, Reign of Madness. Review: Set between 1845 and 1847, this novel is narrated by Frances Osgood, a Boston blueblood who enraged her family when she eloped with a talented, but grasping, portraitist. Abandoned now by her serial philanderer husband, she is living with friends as she struggles to make enough money from her writing to support herself and her two daughters. When she meets Edgar Allan Poe -- newly superfamous for his poem "The Raven" -- her life becomes more rich and more complicated as he helps her career and spurs intense passion. 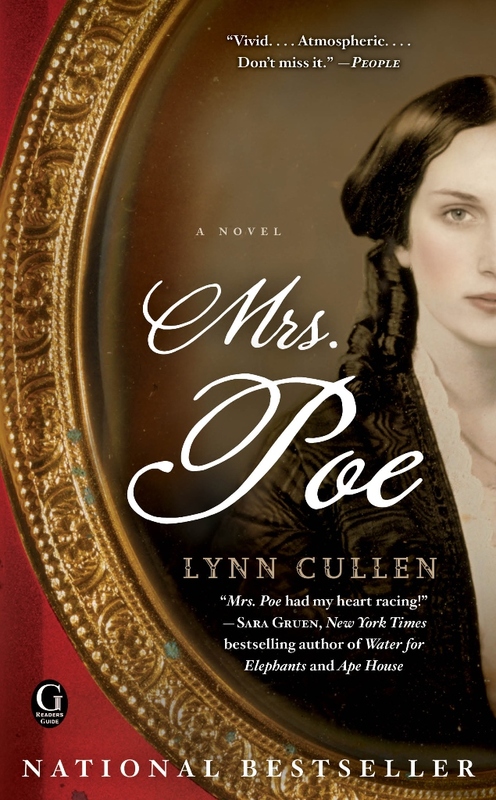 Complicating things, however, is Poe's childlike wife, who is a mix of sweetness and vindictiveness that has Frances torn between guilt and anxiety. Mixed into this cameo-laden fest are the atmospheric historical details that I love in hist fic, from hints about costume and dress, social behaviors, inventions and other industrial changes, and the juxtaposition of wealth and poverty. And while the love story didn't work for me (it's the rare romance sprung out of infidelity that can warm my heart! ), I still greatly enjoyed the drama and atmosphere in Mrs. Poe. The gothic overtones to the story harken back to the 19th century penny dreadful and echoes Poe's works, and make some of the credulity straining moments feel less outrageous. This edition includes the entire text of Poe's "The Raven" as well as as a poem by Osgood, and a brief Author's Note. Perfect for summer, this is a great novel for longtime fans of Poe as well as those unfamiliar with him and his world. It's eye-opening, a little provocative, and dramatic fun. I don't read much historical fiction and thought this book sounded interesting. I was hoping to see you'd loved it. Hi Audra! I’m a huge fan of your blog and your way with words and look forward to your reviews. While I am sad that Mrs. Poe didn’t strike quite the chord with you that Reign of Madness did—your rave review for Reign of Madness actually brought tears to my eyes…and then I started jumping for joy—I’m grateful for your mentioning the aspects of Mrs. Poe that worked for you. I greatly value your opinion and appreciate the time and thought that you put into this review. Second review in the last ten minutes that has me wanting to read this one, despite my normal hesitancy about historical fiction. Do eeeeeeeeeeeeeeeit! I'd love to see what you think of it. I don't know what your hesitancy abt hist fic might be, but for a big, dramatic, personality-laden gothicky drama, this does not disappoint.